Jihadists allied with anti-Assad rebels on July 31 launched an attack on Syrian regime forces in an effort to break the siege on Aleppo. Assad’s forces, backed by Iran and Russia, have surrounded rebel-held districts in Aleppo since July 17, cutting the main supply line into rebel-held neighborhoods in the north of Syria’s second-largest city. Jihadist members of Islamist groups such as Ahrar al-Sham and the former Nusra Front – strategically re-branded Jabhat Fateh al-Sham after claiming to break from Al Qaida last week – said they had begun a battle to try to reopen a new supply route. Jihadists from Fateh al-Sham launched two car bomb attacks against regime positions in suburban Rashidin in southwestern Aleppo, the Observatory reported. In Aleppo city, Assad regime forces bombarded rebel-held districts on July 31 despite the announcement by Damascus and Moscow of humanitarian corridors to allow civilians and rebels ready to surrender to leave. Syrian government media reported on July 30 that dozens of civilians and rebels had left besieged eastern Aleppo through humanitarian corridors, but residents there and rebels dismissed the claims as “lies”. 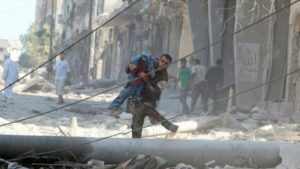 Meanwhile, at least nine civilians were killed on July 31 in an air strike that hit a makeshift hospital at Jassem in the southern province of Daraa. The International Rescue Committee, which supported the facility, called on the UN Security Council “to act in defense of the most basic principles of the UN. The bombing of hospitals is never justified. All those involved must be held to account,” IRC chief David Miliband said in a statement.